My wife surprised me and ordered Pop's pizza delivered for the first time to our house tonight. (She is insisting that I explain it was because we have a 13 month old daughter and she couldn't get it together to make dinner. Okay, so we don't eat like kings every night.) Anyway, when we sat down for dinner, she had a pizza in the oven on a sheet pan, so I figured we were having some sort of frozen Amy's or something. I took a bite and immediately knew something was not the same. I asked her which flavor of frozen pie we had and she said, "ha!, It's not frozen, it's Pop's Backdoor take out." She admitted she had a tough time deciding which pizzas to order considering the specialty pizza choices on the menu. There's a great package deal with a large specialty pizza, two salads and a bottle of wine for $40. The decision was made to go with the Margherita plus proscuitto and the Polpette: house-made meatballs, broccoli rabe, roasted garlic and Parmesan. Both were 10" size @ $10 per piece. We were in the free delivery zone as an added bonus. Delivery time was quoted at 45 minutes and they were right on time. I have to say I was really happy with the pizza flavors. I won't comment on the crust because I was late getting home from work, so she had to keep them warm in the oven. We have a gas oven which means lots of moisture in the heat and let's just say the crust was a bit floppy. But that has nothing to do with Pop's. The toppings were generous, flavorful and very well done. Every bite had all the flavors and things like the meatballs were not sparse. We also had Caesar salad and two small gelato cups. Customers are often surprised when they make their first trip to Wine Authorities and frequently use the F or C words. While I think they mean it complementarily, we don't like to hear "is this a franchise?" or "is this a chain?" I think it's because of the way the store is presented. Folks are not used to an independent wine shop looking clean, being organized, having proper signage and appearing bright and colorful. I am not saying that a franchise or chain is a bad thing. If we can spread the word about estate-grown wines by having multiple stores, then we are all for that. Unfortunately we have seen many wine chains & franchises come and go, that we don't want to be a part of that group. If we do go in that direction one day, we will certainly be TOTALly different. Finally, enough of our pink wines have arrived to build the Rosé Garden. 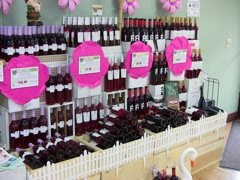 I built my first retail rosé garden wine display around 1998 or 1999. It was a big deal then as the notion of dry pink wine was strange in this country. While getting people to try pink wine is a bit easier today, it is still a foreign notion to many of us, ten years later.